Early in 1980, people with Mennonite backgrounds living in Mississauga and Oakville were surveyed regarding the potential for establishing a Mennonite fellowship in the area. By autumn of that year, this had resulted in meetings every other Sunday evening at South Common Church Campus with up to 25 people attending … to become better acquainted, to worship together, and to explore further establishing a more “permanent” fellowship. 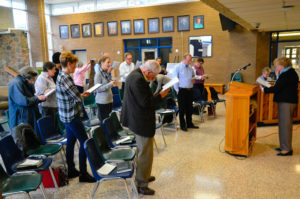 About half of those in attendance were from Toronto United Mennonite Church, some were from the Yorkdale Mennonite Brethren congregation, and others attended local churches while maintaining membership in Mennonite churches “back home” (Niagara, Leamington, Waterloo …). Within a year the group felt ready for a better established and regular programme, so it was agreed to meet weekly on Sunday mornings, starting in September, 1981. In preparation, five study / work groups began planning … worship services, education, organization, finances, social and outreach activities, and physical facilities. Each group was represented by one of its participants on a steering committee to provide coordination of various efforts. Issues arising from the work of these groups were discussed within the entire fellowship, and decisions made by consensus. 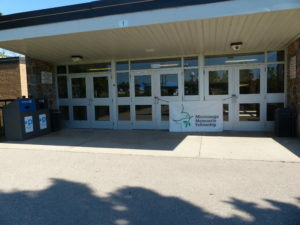 The first Sunday morning meeting was on September 13, 1981 in a large meeting room of the South Common Community Centre. After the intergenerational worship service, Sunday school groups dispersed to the corners of the room … adults to one corner, and groups of children in the other three corners. Guest speakers served the fellowship twice per month: participants in the fellowship spoke on the remaining Sundays. Fellowship meetings occurred monthly to continue direction of the groups “evolution”, and for social interaction. During that first year, MMF drafted its covenant, then celebrated commitment to it on May 30, 1982. Also in 1982, facilities in Erindale Secondary School became available for renting on Sunday mornings. MMF seized the opportunity to provide separate spaces for the Sunday school classes. It has been the physical home of MMF ever since. For some years, MMF had no hired pastor. A Lay committee served as worship coordinators and in the traditional “Deacons” role. The steering committee served to coordinate overall activities of MMF, including financial aspects. Part-time pastors have been hired to work with the Lay committee on spiritual nurture and development of the Fellowship as well as outreach. 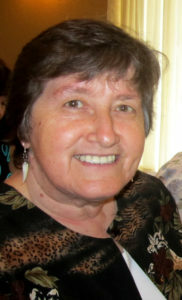 My wife and I learned about Mississauga Mennonite Fellowship after visiting their website. We had been searching for a church to call home for over two years. We wanted a fellowship that was small and actively involved in each others lives, and were drawn to MMF’s intimate numbers. We attended our first service with our 3 month old daughter, and were warmly greeted, noisy baby and all, and quickly welcomed as family into their fellowship. We’ve now been attending MMF for over two years, and remain so grateful to be a part of this body of believers. Our family moved to Mississauga in 1987 but we continued to attend our church in Toronto on Sunday mornings, until my son, age 6, declared that he would rather stay home with his father than sit in the back of the car for the long drive to church. So I made an agreement with him and my daughter (age 10) that we would try a local church, one after the other, for a month each until all three of us were ready to say this was the one! Having Mennonite roots, we began with the Mississauga Mennonite Church that met in Erindale Secondary school. We found the group so open and friendly and caring, that it took only 2 Sundays for all three of us to agree that we had found our church! I appreciated the involvement in helping lead worship, in the regular fellowship meetings and potluck lunches—even a sermon once a month was delivered by one of the group! Guest speakers helped to broaden our outlook and the regular sharing of joys and concerns helped us to stay connected with what was happening in other people’s lives. Even children got a chance to be part of the worship service with special music, reading the Bible passage, etc. I am still a regular attender here. 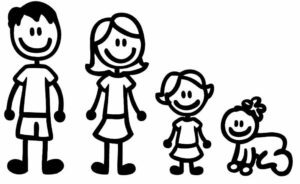 My daughter got married and moved to the States but she, her husband and two boys are all active in their church. And that six-year-old son is now the proud dad of a 3-year-old who along with his wife (active in the Lay Group) still regularly attend the Mississauga Mennonite Church, even though they now live in Burlington. We will always be grateful for MMF’s committed example of following Jesus in their worship and in their daily lives.